Our expert team is highly skilled in treating a wide range of conditions, helping our patients achieve healthy skin and regain confidence. We have extensive experience caring for acne, various forms of skin cancer, rosacea, moles (nevi), psoriasis, rashes, warts, and more. One of the most common skin conditions in the United States, acne involves pimples occurring on the face, chest, and back. The condition comprises two kinds of blemishes. The first, whiteheads and blackheads are non-inflammatory, and are unlikely to result in scarring if they don’t get infected. The second, red pustules or papules, are inflamed pores that collect pus and can result in scarring. Under normal conditions, glands under the skin secrete an oily substance called sebum that moves along each hair follicle then onto the skin’s surface, taking old skin cells with it. When acne occurs, the sebum and old cells get trapped below the skin, producing whiteheads or blackheads. If these blemishes become irritated, they may turn into red pustules or papules. Scratching or picking at these lesions can lead to scarring. A common type of cancer in the United States, skin cancer is generally curable when caught early. People who have had skin cancer, however, are at a higher risk of developing a new skin cancer in the future, making regular self-examination and visits to your dermatologist a vital part of your health. The most common type of skin cancer, basal cells are found in the deepest layer of the epidermis. Overexposure to UVB radiation damages the body’s natural repair system, causing basal cell carcinomas to form. These are generally slow-growing tumors that rarely spread. Most basal cell carcinomas occur on the face and neck because these areas get the most sun. Regardless of the appearance, these lesions all tend to bleed with little or no cause. There are many risk factors for basal cell carcinoma, which include sun exposure, ultraviolet radiation exposure (tanning beds), fair skin, advanced age (most skin cancers occur in people over 50), and therapeutic radiation used to treat other health conditions. A diagnosis of basal cell carcinoma requires a biopsy that involves removing either all or part of the tumor. Mohs Micrographic Surgery: Combining the removal of cancerous tissue with microscopic review. Used for large tumors, this method allows surgeons to save more healthy skin when removing the tumor. Found in the upper layer of the epidermis, squamous cells appear as crusted or scaly patches of skin with an inflamed base and are usually tender to the touch. Most frequently appearing on the scalp, face, ears, and back of hands, squamous cell carcinoma can develop anywhere, such as inside the mouth and on the genitalia. The condition tends to occur in fair-skinned, middle-aged, and elderly people with a history of exposure to the sun. Squamous cell carcinoma sometimes evolves from actinic keratoses, which are precancerous, scaly lesions that can be flesh-colored, yellow-black, or reddish-brown, and appear on rough or leathery skin. Like basal cell carcinoma, squamous cell carcinoma is diagnosed using a biopsy that removes either all or part of the tumor. Although melanoma is the least common form of skin cancer, it is the most aggressive. Melanoma is also the most common type of cancer found among adults between 25–29 years of age. Melanocytes are cells in the bottom layer of the epidermis that produce melanin, the substance involved in skin pigmentation. This is why melanomas frequently appear as dark brown or black spots. They can look like moles and often form inside existing moles. While the majority of melanomas are caused by overexposure to the sun beginning in childhood, they can also be hereditary. Melanomas are dangerous because they spread quickly to internal organs and the lymph system. Early detection is essential to curing this type of skin cancer. It is crucial for people to conduct regular self-examinations in order to catch potential skin cancers early, when they are most treatable. Melanoma is diagnosed using a biopsy. There are many treatments for melanoma, including radiation therapy, chemotherapy, and surgical removal. If you notice any of these warning signs, make a dermatology appointment immediately to determine if the mole or lesion is cancerous. Avoid the sun during peak times (10 am to 4 pm). Cover arms and legs with protective clothes. Wear sunglasses and a wide-brimmed hat. 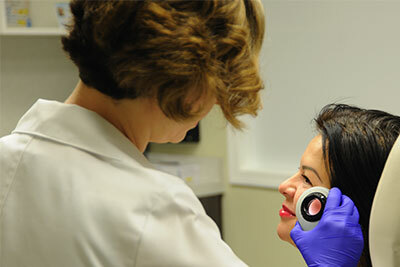 Check your skin each month and call your dermatologist if you see changes. Get regular skin checks. Adults should be examined annually by a dermatologist.